The basis for the quiz is a Hungarian Kentenich website where more and more data about Fr Kentenich is published, as well as texts from his works and videos about him. The quiz takes place over a number of months. Each week there are ten new questions. In order to answer the questions people will need to spend about 100 hours on average reading the Kentenich website. On average between 40-60 youth and adults take part in a quiz. The aim is to make Fr Kentenich and his mission better known – in Hungary and beyond. The initial planning for an international Kentenich Quiz has already begun. 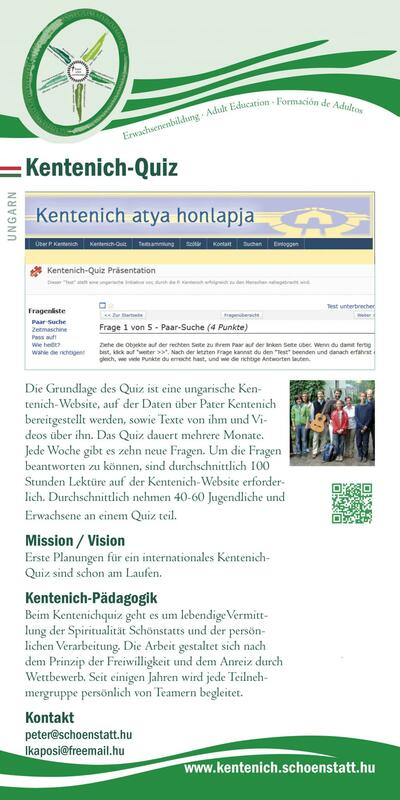 In the Kentenich Quiz what matters is to pass on Schoenstatt‘s spirituality in a vital way, and to enable people to assimilate it personally. The work is done according to the principle of voluntary choice and the attraction of competition. For some years now each group of participants has been personally accompanied by members of the team.